I’m safely and happily home after a very long but uneventful trip back to Texas. Thanks for your interest and prayers. I met with a some good friends with a new baby to begin the day. Following this, some of the Christians met to visit for a while. We had our worship at 4. It was the regular crowd. It seems the difficulties Jan and Kamila have been facing for some time may soon come to a sad conclusion. This obviously cast a pall over our worship. Other wise it was encouraging. It always amazes me what wonderful singing such a small group can have. The Planetovi family is doing well. Joseph is still working hard on his Bible study software. Their children are doing fine. I’ll attach a few pictures from before the worship. The study in Brno was very encouraging. On a cold rainy day people responded well to the 3+ hours of teaching. Unfortunately to make the train to Bratislava we had to slip out quickly. Visiting with Lucy gave me an even better appreciation for her strong faith. Sadly, it also gave me a better sense of how desperate the situation with the church there is. I promised to spend some time there in the spring. They desperately need someone to work with them long term. Tomorrow afternoon I’ll get to meet with the Christians here in Brno before worship. After our meeting i’ll take a bus back to Prague. The software has changed and I don’t have a lot of time to figure it all out. The group study in Prague Wednesday night small. In addition to the Morrow’s and Tatana’s mom, only Karel attended. It was very pleasant as we spent the entire hour discussing various leftover questions form the lecture the night before and how they applied to our present world. I’ll include pictures of the folks who attended below. I’ll also include some photos of “street scenes” in Prague. The man the police were talking to was a beggar with his cane. It was amazing to see how fast he stood up when he saw the officers coming over. Such people really compound the difficulties for those who are truly destitute. As a whole, things are booming in Prague. I’ll include a shot from one of the many new malls in the city. 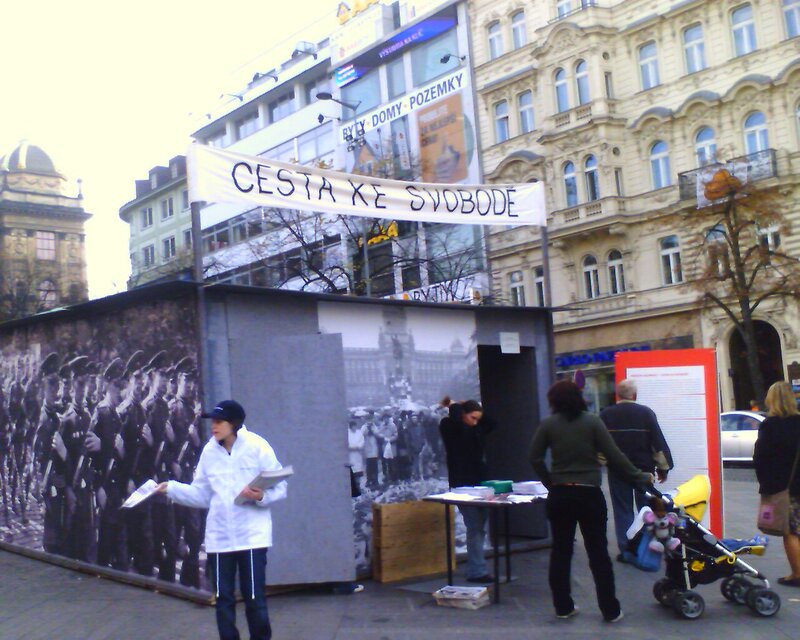 The makeshift structure with the sign in Czech is a portable museum dedicated to the memory of those who fought against communism. The turnout for the lecture Thursday night exceeded everyone one’s expectations. As is typical here, people arrived late. At the announced starting time, the only visitor was a friend of mine the Alligators days. Within a few minutes however, we had 10 first time visitors. The discussion was lively and only ended when the two hours we had the hall rented for expired. I stick in a couple of pictures I took with my phone during the Q&A session. Finally, these posts are courtesy of the free wifi at my friendly neigborhood KFC. After the lecture, I went for supper with my old friend. It was a pleasant discussion, but he is a long term project. I met with Kamila for a while around noon today to discuss her situation. It look like everything is coming to a head. I’ll see her again on Sunday. The trip from Budapest was delayed by an airline issue. As a result of that, I missed my opportunity to see the Tost’s. I should get to see them Saturday in Brno. My train to Prague left at 5:30 yesterday morning. A little over eight hours later I was in Prague. I went to the Morrow’s to go over some details for the lecture with them. Attendance wasn’t great, but we did have several first time visitors. The Christians seemed well pleased with how it went. Today I’ll have a group study at the Morrow’s in the evening. As always, it is wonderful to be in Prague . The pictures will include one showing the sad plight of the homeless in Budapest as well as some shots taken before the lecture started. The quality is poor since circumstances called for me to use my phone rather than my regular camera for the shots. Sunday was a good day. We had an unexpected guest at worship. She visited for a few minutes afterwards. Her presence did a lot for the rest of the group. After services, we went out to lunch together. Following lunch, Biss and I went to see Draga. She immediately got her Bible out to study. After the hour, Biss and I prevailed in our insistence we would go buy her some food. As always, it was an amazing visit. Her health doesn’t seem to have deteriorated since last time. After a couple of hours, we met again for a group srudy. Much of our attention was focused on Dinyu’s upcoming trial. The process is crushing him. I’ll fly back to Budapest tomorrow. Shortly after my arrival I scheduled to meet with Emese and the Tosti’s. ay not look sanitary, but was still hot from the oven.